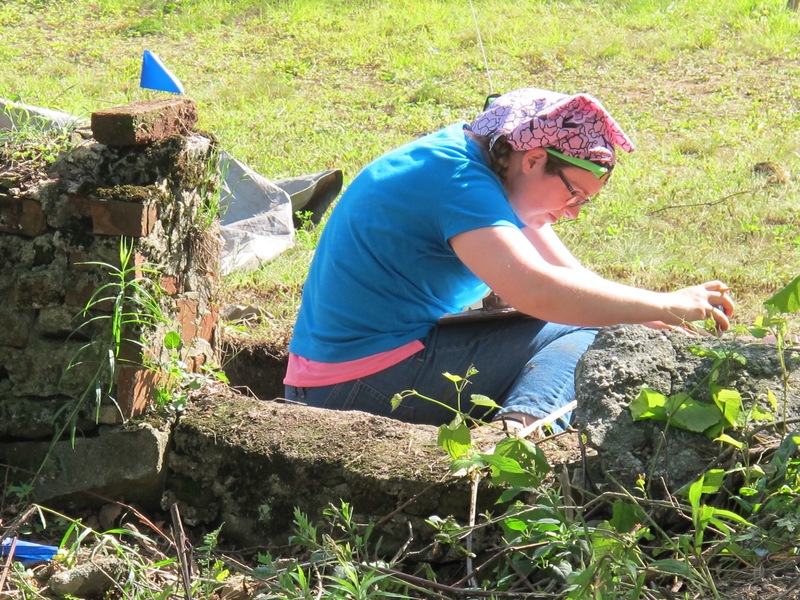 More digging, more artifacts, more excitement, and a recap of Patchtown Days. Read on to hear about what’s new in our fourth week at Eckley Miners’ Village! The beginning of the week was spent focusing on House Lot #34/36 (the house lot next door to the house lot we have been excavating this summer). As part of our research plan, we dig shovel tests, small round holes about a foot in diameter, every ten feet on a grid across the site. Since we know we will be back excavating on Back Street next summer, we are getting a leg up on the work for next year by finishing this crucial first step now. We have found some promising and exciting artifacts in our shovel tests such as smoking pipe fragments, cut nails, and a jack game piece. I’m sure the excavations next year will yield artifacts that are just as exciting (or even more exciting!) than the excellent finds from this year! While we have been expanding our archaeological horizons, we have also continued to work on finishing up the test units we have open at House Lot #38/40. We closed one of the three remaining units we have open while Mikaela and Dolly work diligently on finishing up the last two. While it is always sad to close up our excavations for the year, it also means that we will have plenty of time to complete the lab portion of our excavations and introduce the field school students to the entire archaeological experience, from excavation to cataloging. We were also lucky to have three new additions to our work this week! Last Sunday we were delighted to meet Aaron D., who joined us for a week from Edinboro University. Aaron spent his week excavating, washing artifacts, and learning the basics of sorting and identifying artifacts, as well as getting to experience Eckley’s coal mining heritage first hand. Thanks again for coming out, Aaron! In addition, we had Megan from the University of Maryland come out to join us in the lab! Under Megan’s excellent guidance, the lab process – which includes washing, labeling, sorting, bagging, and entering all of the data into a computer – has been streamlined and is moving along at a rapid pace. 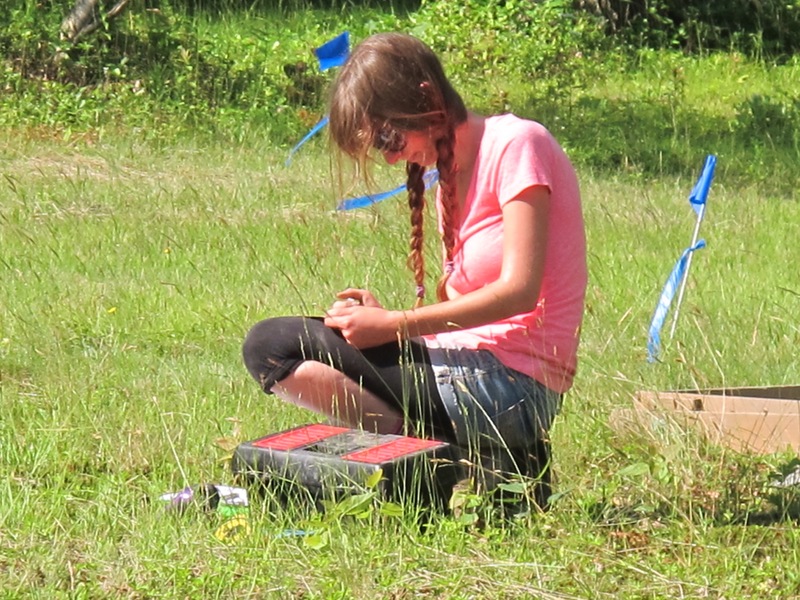 Many thanks to all of Megan’s (and the field school students’) hard work on getting our lab up and running! We also had the good fortune of meeting Mitch S.! Mitch is also a local volunteer who helped us out in the field and in the lab for Patchtown Days. We are extremely grateful for the time Mitch took out of his week to spend with us and we hope to see him again before the end of the summer! Volunteers – Mitch, Stephanie, and Aaron helping out in the lab. We were also fortunate enough to be invited to the opening of the Company Story exhibit in the Eckley Company Store building on Friday afternoon. The students got a chance to peruse the building and see the complete makeover of the interpretation. We were also joined by three University of Maryland faculty – Dr. Lafrenz-Samuels, Dr. Getrich, and Dr. Little, and their guests – who were able to tour Eckley and enjoy some of the activities of Patchtown Days on Saturday and Sunday. As we focus more on the lab portion of the field school, new and exciting revelations are being made almost on a daily basis! The students are learning about different manufacturing processes for nails, ceramics, and glass, and how each of these manufacturing processes left different physical marks on the artifacts that we can use to identify and establish the age of the item. The Back Street Girls (plus Aaron) did a superb job of explaining these differences as well as describing the entire lab process from start to finish to our visitors during Patchtown Days. While Saturday was rainy, Sunday was non-stop visitors from 9am to 4pm! We had an excellent showing and all of the students had an opportunity to explain the process to groups of visitors. 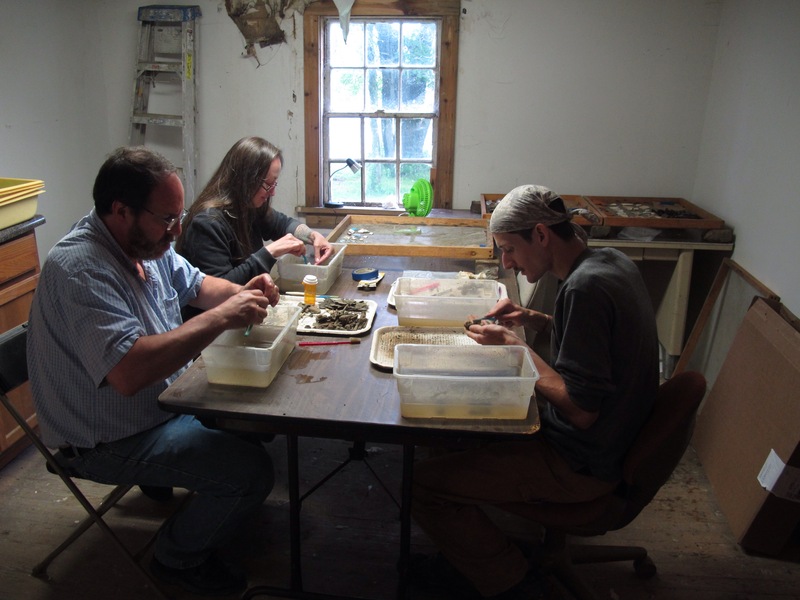 In addition to the lab, we also opened the excavations so people could see where all of our artifacts were coming from! All in all, it was a positive learning experience and an opportunity to illustrate to students the importance of public archaeology. Some previously unidentified artifacts are becoming recognizable in the lab as they are washed and sorted. 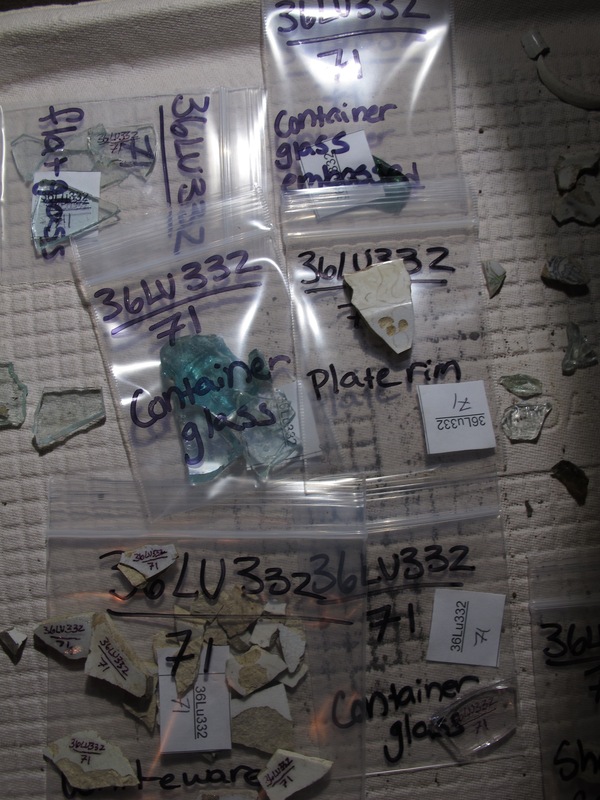 Exciting new finds include pieces of carnival glass, a ceramic doll foot, and perhaps even a celluloid billiards ball! While they are neat objects in and of themselves, they can also tell us something about the lives of the people who lived in these houses – poor lighting inside the house was combatted through the use of the iridescent carnival glass, children were kept entertained through tiny ceramic dolls, and someone snagged a billiards ball from one of the local establishments – possibly three miles away in Freeland, the closest town in the area where it was legal to purchase alcohol. All of these stories can help us understand what life might have been like in the earliest decades of Eckley’s existence. The end is coming! Our final day at Eckley will be July 10th, although we will be gone July 3rd through the 6th in observance of the Fourth of July. We invite those in the area who are interested to come out and join us for a day! Hey Andi, I corrected it!